In this publication, Equity in the Center illustrates how organizations can move toward a Race Equity Culture, one in which one’s race has no influence on how one fares in society. The work of creating this culture requires an adaptive and transformational approach that impacts behaviors and mindsets as well as practices, programs, and processes. 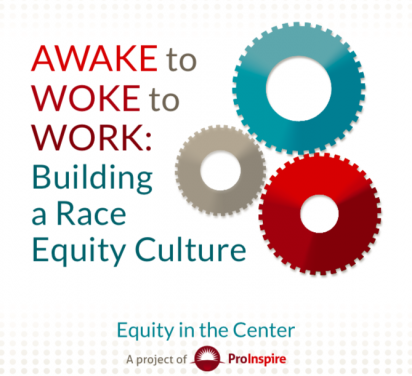 Awake to Woke to Work: Building a Race Equity Culture provides insights, tactics, and practices that social sector organizations can use to measurably shift organizational culture, operationalize equity, and move from a dominant organizational culture to a Race Equity Culture.